What is another name of sea eagle? The sea eagle also called as erne. Other common names.... 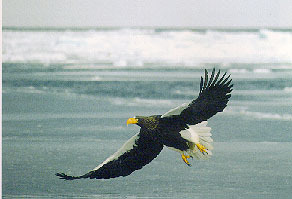 In English, "Steller's sea eagle", "Pacific eagle" or "white-shouldered eagle. "In Russian, "morskoi orel" (sea eagle), "pestryi morskoi orel" (mottled sea eagle), and "beloplechii orlan" (white shouldered sea eagle). In Japan, "0-washi." SEA eagle's lower legs are unfeathered and its bright yellow bill is longer and heavier than the gray bill of golden eagles. Sea eagles inhabit coastal regions and the vicinity of lakes and streams, and feed heavily but not exclusively on fish. I believe the answer is "Erne"